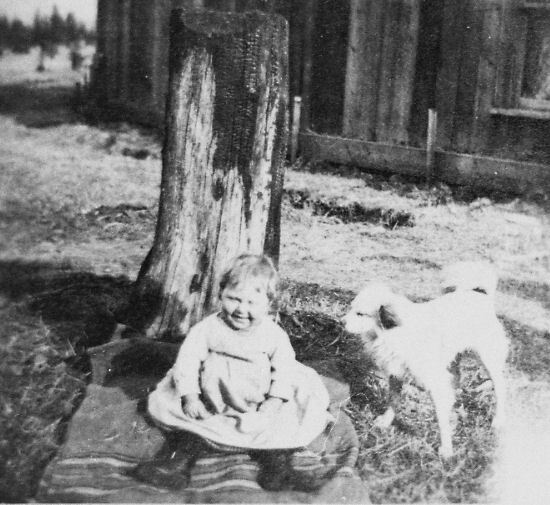 Henry and Bessie Knott at home in Heron, Montana. Circa 1890s. Courtesy Georgia Knott MacSpadden collection. ﻿From time to time Indian women wandered into Mrs. Knott's kitchen where they squatted, unnervingly silent, to watch her cook. Later the hotel succumbed to fire, leaving only the cement foundation. Children found challenge and fascination walking it's narrow and broken surfaces.1. Social life was virtually nonexistent in the clearing along the railroad tracks at Noxon, saloons being the only gathering place. Harshness erupted from time to time. Thomas Carroll was beating his wife at Noxon one cold rainy day in March 1889. Bruce Hatch tried to stop him. Carroll hit Hatch in the chest with a gun, pushing him. Hatch shot Carroll, but not fatally.2. In October 1888 the NPRR's railroad terminal at Heron was moved to Hope, Idaho, because Beaver Creek had gone dry depriving the steam engines of the water vital to their operation.4. This was a major blow to the community,almost wiping it from the map. Few white people remained, and Heron's post office was closed on November 6, 1888.5. But the railroad had built a nice depot there with a cozy waiting room so it was kept open. Mr. Henry Knott was stationed there to operate it. He and his family lived in the two-story sectionman's house. The railroad's almost new hotel also remained in operation. In May, David Collard, a saloon owner at Noxon, resorted to gunplay as well. Hearing a noise in his chicken house, he said, he shot a gun to frighten off the thief.He hit Charles Campbell, a laborer making railroad ties. Collard then went to Bascomb's mill and surrendered.6. He was transferred to murderer's row in the new Missoula County jail in September. That December a jury ruled that he was not guilty of murder. In October, George Stull, who worked at the shingle mill, got drunk for the last time. He fell asleep on the railroad tracks and was run over. His body was found two miles east of Noxon.7. On November 26, 1889 Julia Berray gave birth to Caspar Berray's first son born in the newly created state of Montana. The first child born in Noxon, Frank gave his first lusty cry in the little log house built on the banks of Pilgrim creek, where he joined his older brother, Algie.8. Cap and Jim Berray homesteads on Bull River. Circa 1896. ﻿ It was two years after the Berray brothers arrival in Noxon. Montana had become a state. With statehood came homesteading rights. Cap and Jim took up land in the Bull River valley where fire had cleaned out the upper portion a couple of years before the Tote Road would be built through the valley to freight Great Northern railroad supplies.9. 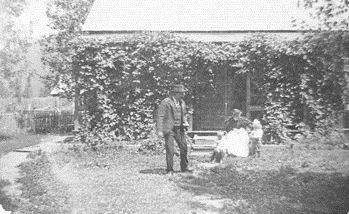 They first located their homesteads by meets and bounds descriptions, Cap's original homestead having thirteen corners. It lay nine miles south of Bull Lake. He selected land at the base of the mountains primarily, following the contours of some of the choicest natural meadowlands through which Bull River flowed. His acreage stretched along the river for nearly the maximum length of one mile, taking in some portions of the steep mountain slopes to either side. Adjoining him downstream, Jim measured out his homestead of one hundred and sixty acres. 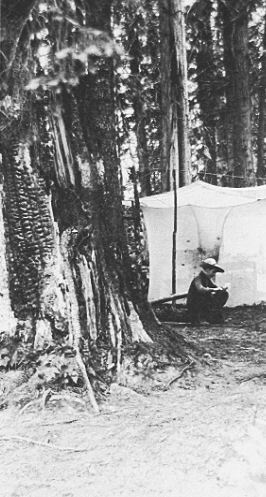 ﻿﻿A canvas tent sheltered them while the expert axe men shaped the logs for their cabins. Smoke swirled into the trees from their campfire as mosquitoes, frogs and birds heralded them with a cacophony of sound. They dug clay from the riverbanks, mixing it into a thick caulk to chink the rising walls of their houses. They built a blacksmith shop between the two houses, joining them together. Then they went back to Noxon, got their cow and all their stored possessions, loaded them into the bateau and moved onto their homestead. Eagerly they took up the challenge of making a home in the wilderness ten miles from the little settlement of Smeads, on the southside of the Clark's Fork River. Jim, Grandma Berray, and two sisters, moved to the ranch to stay and take care of the stock. Julia and Cap's first baby daughter was born, died, and was buried in the Bull River valley on a rocky knoll overlooking their homestead. Soon after, Julia went to Heron to stay for a while with her relatives, the Higgins.10. William J. Higgins. Courtesy Maxine Higgins Laughlin. Great Aunt Higgins. Courtesty Maxine Higgins Laughling collection. 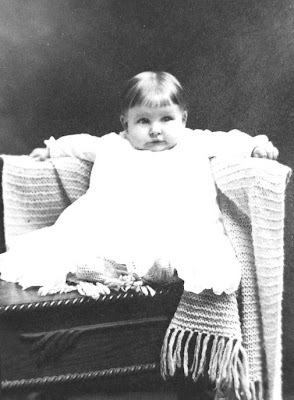 Baby Fanny Saint Higgins. Courtesy Maxine Higgins Laughlin collection. ﻿﻿ During the freighting of the Great Northern railroad supplies over the Bull River tote road Higgins built a stage stop, or halfway house, about a mile upriver from where the East Fork of Bull river flowed into the main channel on land adjoining Jim Berray's land. Here the loads would stop, horses could be fed and tended and men could rest. The next day the journey resumed in the early dawn hours while the air was still chill and dew dampened everything. The next stop was another large log barn where hay was stored for the horses at the next crossing of the river about five miles up the valley as the crow flies. The route wound half again that many miles before this respite from the jarring, back breaking struggle. Baby Laura Higgins. Courtesy Maxine Higgins Laughlin collection. ﻿When the lake was reached, another overnight halfway house would give welcome rest. It was located on the south side of the tote road at the southern end of the lake.12. Possibly because the shoreline of the lake consisted of such mucky soft ground, building a barge landing would have been more difficult than the two miles of lake warranted. For whatever reason, the lake was not utilized to barge the railroad supplies. The trip continued on by freight line, by passing the lake, to its destination at Lake City which was across the creek from where Troy is today.13. William Miles, the express messenger on the NPPR eastbound passenger train was trapped and burned to death in March 1890 when the train went off the track on a curve near Noxon and the dining car caught fire.14. Details of the horror were passed along among men coming to work in the Dillon Lumber & Grain Company mills at Noxon, Heron and Horse Plains.15. NPRR train wreck. Circa early 1900s. Courtesy Willian Finnigan collection. Reinhold Grieger and Michael Keef both became licensed liquor merchants at Noxon in May 1890.19. In October Grieger also got a liquor license at Heron. Frontier life remained largely the domain of men. It was rough, and lacked females and homes. Most of the men patronized the saloons regularly. In July eight men who tore down the Chinese shack at Noxon were fined $20 and costs of $8. They were railway hands. They also had threatened a man named Tooley, thus when he was awakened at night by jokesters, Tooley thought it was the men who had threatened him earlier. His gunshot hit Jerome. Tooley was bound over to the grand jury, fell ill and died in Sisters Hospital at Missoula.16. Matthew Cash, the NP watchman at Quinn's cut west of Noxon disappeared one night in July. When his body was later found over the Idaho line it was presumed he'd fallen off the bridge and drowned.17. Dunn Barret, a man of 25 or 26 who had been working for T. H. Smith, drowned when his boat capsized in the river.18. During the homesteading era, being a 'business man' denoted a certain degree of respectability. James W. Ruddy was an all-round man, being a carpenter at Trout Creek, licensed liquor merchant at Noxon with a license also at Lake City.19. He was appointed election registrar at Noxon District 4 September 1890.20. Voters were first required to register the preceding year when the statehood election was being held.21. 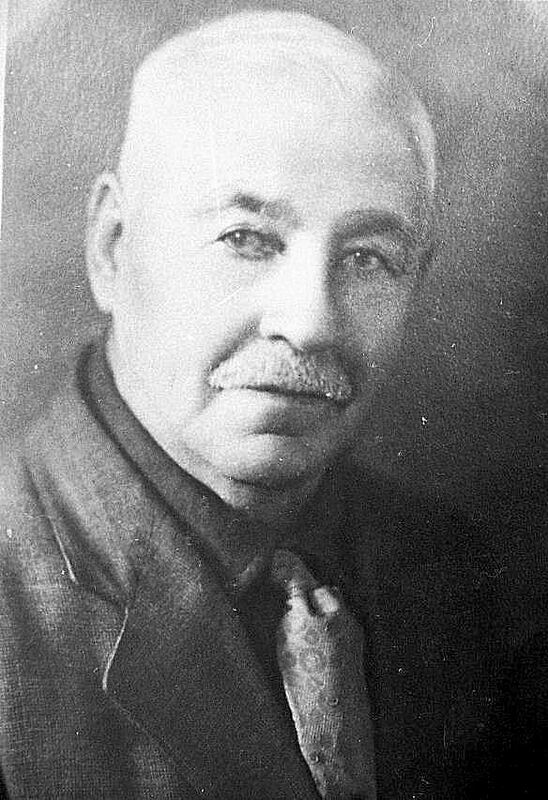 Charles Woodburry was the first registrar, serving both Noxon and Trout Creek. In 1890 forty-eight votes were cast at Noxon. Sam Higgins, J. V. Nesbitt, and T. L. Greenough were judges. Thomas H. Smith was also an election judge that year.22. Although Trout Creek still had a population of one hundred, only eleven votes were cast at Kelly's Saloon in the Trout Creek precinct. James F. McLin had the post office in his store and saloon, while Mrs. M. McClellan had the only hotel. Pat Kelly, the saloon owner, B. S. Dudley and J. W. Ruddy were carpenters.23. Almon W. Bascomb was appointed postmaster at Noxon on January 23, 1891, succeeding Thomas Smith.24. Six months later, on June 30, 1891, a post office was established at Smead with Winfield S. Hair postmaster.25. The State Lumber Company shingle mill began operations in July. It had been incorporated March 9, 1891 in conjunction with Justin E. Morse and David Lamont from Dillon. Eight to ten houses, a company store and two saloons comprised the community of Smead.26. 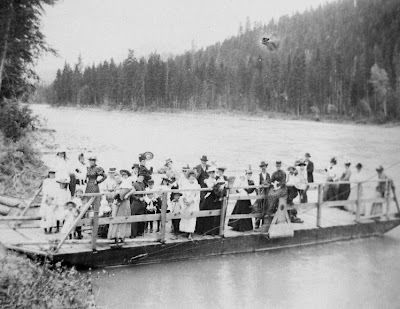 The county commissioners at Missoula were persuaded on July 9th to license James Rutherford to run a ferry across the Clark's Fork River at Smead's Spur for $40. A week later, on July 16, they gave the license to Carson Rutherford & Company to operate it.27. In October W. H. Carson bought Elligan's boardinghouse, saloon and store at Smeads.28. The lumber company had built seventeen miles of road up Bull river and wanted the county commissioners help to complete it to Lake City.29. O. F. Payne secured a liquor license at the 25 Mile House. His address was the Noxon post office so whether his establishment was in Noxon, or on the Bull River tote road is unknown.30. Smead Township was created September 10, 1891 with boundaries beginning one mile south of Noxon, thence west parallel to the NPRR to Idaho, north to the Cabinet mountains, east along the mountains to Halfway House, thence along mountains to a point opposite Noxon.31. Caption" Smeads. Courtesy Elizabeth Larson Weber collection. In August 1891 James Burns obtained a liquor license at Noxon. A man by the name of Johnson joined him the next year.32. Ed. J. Crowe took over the postmaster position at Trout Creek October 14, 1891.33. On November 12 the county commissioners paid $1,500 for the bridge that crossed Bull River, on the road from Smead's Spur to the Kootenai River.34. Thomas H. Smith, a merchant at Heron in 1886, went into the saloon business at Noxon in 1892.35. The election-polling place was moved to the NP railroad station house in Noxon. Here voters decreased from forty-eight the previous year to twenty-six in 1892.36. Bascomb, the lumber manufacturer, had a store, Dunn, Hartwell and Company had a drugstore, Johnson and Burns, J. J. Kelly, James W. Ruddy also had saloons, making four saloons for the railroad crews and transcient lumberjacks.37. January 22, a delegation went to Missoula to present a petition to the county commissioners to change the county road between Smead and Kootenai to cross the river at Higgins' bridge instead of going around by McJunkin's place.38. Smeads Ferry on the south shore of the Clark's Fork River. Circa 1880s-1890s. X is Amy Higgins holding one of her sons. Courtesy Maxine Higgins Laughlin collection. On February 29th Mr. and Mrs. Henry Knott at Heron had a baby girl, Georgia. She was the last leap year baby of the century to be born at Heron and was to become Heron's first student to achieve high school graduation. (She would become the first teacher in the schoolhouse up the gulch called Elk Creek south of Heron).39. 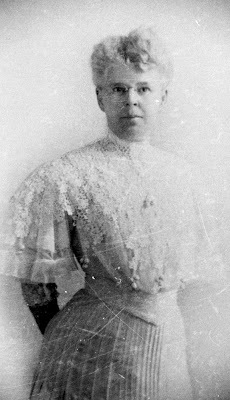 In May 1892, Maud V. Davis, prim in her white collared, floor-length gown that demurely hid her high top button shoes and trim ankles, was the school teacher at Heron. Although the population had declined, the people who remained were eager to give their youngsters an education. They were successful in convincing the county commissioners, in session more than a hundred miles away at Missoula, that a teacher should be provided for them.40. School was held during spring and summer months to compensate for the bitter months of winter when it was often "recessed" because deep snow made it impossible for children to get there.41. In the election that year at Hornberger's House, twenty-one votes were cast. Hornberger, John Davis and Henry Knott were the judges. The election at Noxon was again held at the NP railroad stationhouse. Twenty-six votes were cast. The population of the voting precinct was fifty.42. Kelly, G. Posey and E. Munchen, election judges at Trout Creek, had only eight votes to count in Kelly's Saloon.42. Early in the year Fred A. Van Riter was Trout Creek's postmaster, but by fall E. J. Crowe was postmaster and railroad agent.43. The population had dwindled to fifty-seven.43. Before 1892 ended the Great Northern railroad completed it's tracks between Troy and Libby.44. Contracts for toting freight ended. 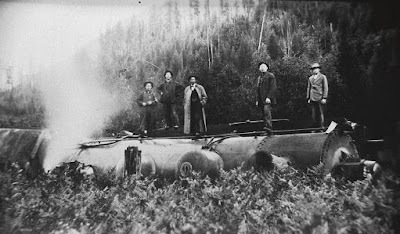 Many men drifted on northward into the Kootenai River valley and rode the new railroad east or west, as inclination and prospects beckoned them.45. 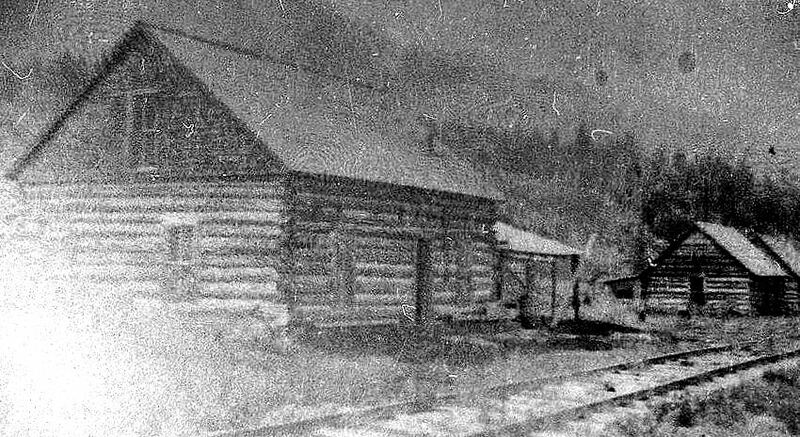 Ed Hampton, who had come to Noxon from Alberta, Canada, homesteaded on an island in the Clark's Fork River in front of where the NPRR had built their depot and small complex of buildings at Noxon. Since the forest fire had cleaned it, it looked like a good prospect to grow hay and have some cows, and he built a sawmill. His brother, Arthur soon arrived with his bride, Florence.46. Heron street scene during early 1900s. Courtesy Elizabeth Larson Weber collection. Teaching school was not the easiest profession in a community comprised of several nationalities with their differing religions and politics. Young, stalwart, Lizzie Smith tackled the job at Heron Siding in April 1893. Every morning she greeted her charges with the pledge of allegiance to the American flag, followed that with a moment of prayer, then set to the task of teaching reading, writing and arithmetic to children of widely differing ages.47. The tie hackers, blacksmith, camp cook and roustabouts employed in the railroad tie camps along the Clark Fork worried over the financial situation as a great world wide economic depression brought a cessation of nearly all expansion that year. The financial panic started when Europe began selling American securities and withdrawing gold. The United States ability to maintain specie payment was threatened. President Cleveland feared the public would begin hoarding gold. Business distress rapidly became widespread. When the Silver Purchase Law of 1890 was repealed in 1893, the people in the west and south felt that Cleveland had betrayed them. Daniel C. Corbin and his associates had just built a railroad from Spokane to the Coeur d'Alene's, opening up rich silver and lead deposits for development. The gold-silver controversy became bitter. The Stock Exchange was in a panic. Capital (the money barons) and labor (the common working man, who was predominantly immigrant) contended in almost war-like fashion. Labor strikes began occurring and as economics eroded further, the public blamed both capital and labor for the costly strikes.48. A ray of hope sparkled during 1893. In Chicago the Columbian Exposition, popularly called the World's Fair, was attracting huge crowds to celebrate the 400th anniversary of the landing of Columbus. A fantastic fairyland of lights glittered across Lake Michigan as the use of electrical illumination was fully realized.49. While the eastern part of the United States speculated on the advances electricity could herald, in the remote Clark's Fork valley roads, not electricity, were the prime concern of the settlers. J. A. McJunkin took the train to Missoula to put the need of the homesteaders for wagon roads before the county commissioners again. On August 7 the county commissioners made him road supervisor of District 14 which included all the area west of Tuscor to the Territorial boundary.50. Bessie Knott and Mrs. Newell in Bessie's buggy. The old Heron NPRR depot is in the background. Courtesy Georgia Knott MacSpadden collection. Reuben R. Ross became postmaster at Smead August 22, 1893 51. and Sam Miller was licensed the next month, just as fall rains began, to sell liquor at Noxon.52. Tamaracks turned russet, dropped their needles, and stood dead and barren looking as fall slipped into winter and snow blanketed the mountains. The few men broke trail between the far flung homesteads, chewed the rag, shared coffee, venison and cigarettes, and just generally rode out the winter. Women broke the routine of shoving wood into stoves, baking bread and chipping ice from the water buckets by piecing quilts; those who were lucky enough to have needle and thread and scrap material. Noxon's population had dropped to twenty-five in 1894.53. F. E. Wells was one of the early railroad station agents at Noxon.54. He, like all the other men around Smeads, Noxon, Heron, Trout Creek, and all along the Clark's Fork, argued about Coxey's Army. Jacob S. Coxey was a man much in the public eye during the labor disputes. Following the panic he proposed issuance of $500,000,000 in currency and with it pay for road construction. It would, he advocated, relieve unemployment, give the nation good roads, and allow distressed debtors to pay off their obligations. He gathered about 100 men and started a march on Washington, DC. He was arrested May 1, 1894 at the Capitol for trespassing on the grass.55. The rugged lumberjacks in Miller's saloon settled their disagreements with iron-hard bare knuckles. Then had another drink, picked up their mackinaws and staggered back to the tents that were 'home' deep in the forests. 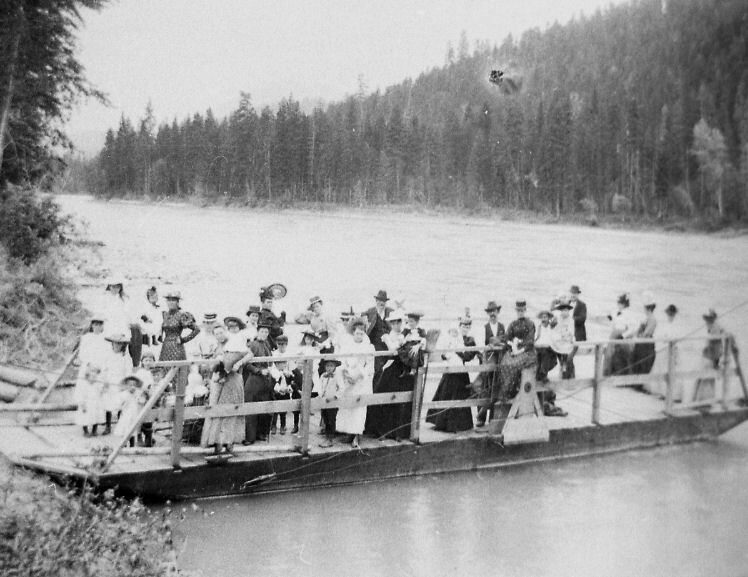 Spring put the Clark Fork River on its wildest rampage since settlement began, severely threatening the eleven-year-old railroad line. 1894 was recorded as the year of THE FLOOD. Andrew Knutson had returned to Noxon and was the railroad section foreman when high water swept away everything along the river banks through the valley.56. It forced evacuation from Ed Hampton's island as the waters rose to a depth entirely inundating it.57. Railroad tracks were washed out and passenger trains were held for over three weeks, both in Thompson Falls and in Plains, waiting for the brown floodwaters, swirling with trees, dead animals and trash, to recede so that track repairs could be made. "Many of the passengers worried for the concern of their friends and relatives. In Plains, a collection of $150 was taken up and offered to a group of Flathead Indians, who were also marooned, to go over the hills with mail and telegrams to Missoula. Six of the bucks agreed to make the trip. The third day after their departure the Indians return and refunded the money saying, 'Only birds could get over the big rocks and deep waters".58. Noxon engineers drove a train onto a railroad trestle hoping that the weight would reinforce the structure against the force of the waters. It worked and the trestle was saved. It was a year in which the forces of nature played such havoc that the early settlers never forgot. It influenced many future settlers against building too close to the river's banks.59. William H. Smead was elected to the Montana senate to represent the Republicans 1894-96. While there he introduced a bill for a memorial to Congress to open up the Reservation for settlement. Smead's polling place was McJunkin's House where McJunkin was one of the elections judges. John Doyle and George Kane were the other judges. (McJunkin precinct was discontinued in 1896).60. 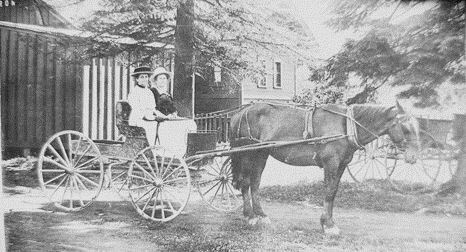 December 18, 1896 Laura A Morse became Noxon's first postmistress, but she served only until January 21, 1897. Ed Hampton became postmaster when she gave it up.61. Andrew and Mary Knutson had a son, Charles, born in the NPRR sectionman's house where a roaring fire kept the cold confined to frosting the upstairs window panes with white fantasies.62. Life in the Clark's Fork valley was changing perceptibly. 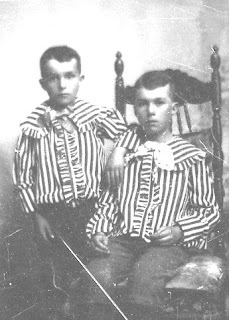 Frank and Algie Berray were among the first students in Heron's one room schoolhouse. Their parents moved from their Bull River homestead to Heron when Frank was about seven years old so the children could have schooling. Algie had a crippled foot and walked with difficulty. Five-year-old Georgia Knott was one of their classmates. Cap and Julia Berray lived about a mile and a half west of Heron. The boys had a little more than a mile and a half to walk to school. 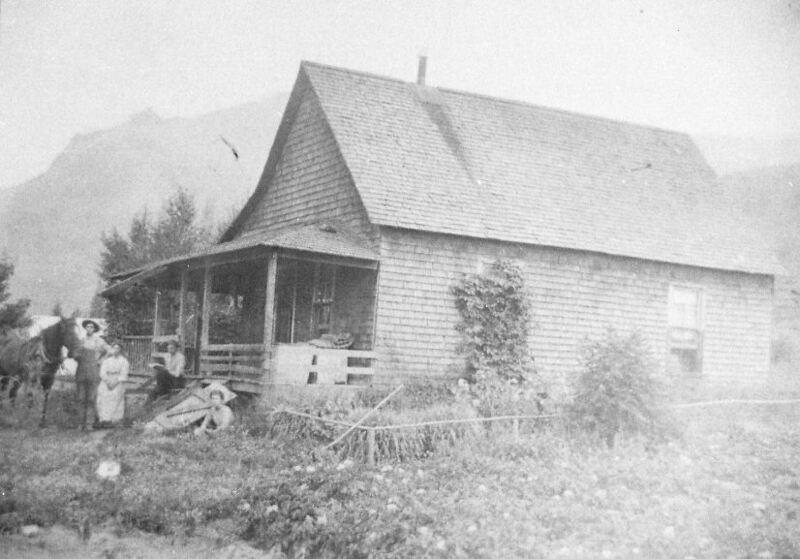 An old house in Smeads, Montana (circa 1900) which was home to 'Dad' William J. Higgins, and Grandma Higgins. Pictured are Fanny, W. J. 'Bill' Higgins, Amy Higgins, and Ray Higgins. Courtesy Maxine Higgins Laughlin collection. One day Frank and a cousin stopped at Dingley's, their neighbors, forbidden apple orchard on their way home from school. It was a sizeable orchard. Told not to pester the green apples, as boys will, they filled their blouses and headed home. 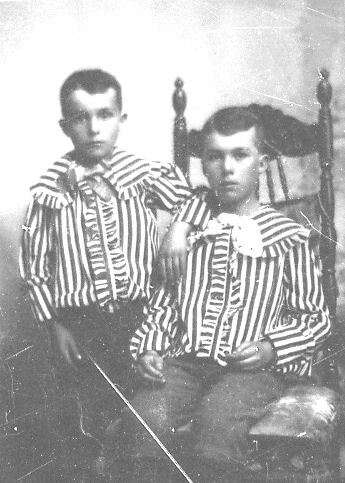 The little lads were met by their fathers who inquired what they had in their blouses. "Did you ask for them?" "You trot right back up there and apologize and pay for them. Or you can have a licken...and then you have to apologize!"63. Frank decided he'd better apologize and pay for them..64. Cap and Julia Berray collection. The boys roamed the wooded area freely when school wasn't in session doing what boys always do. Exploring, learning about the earth and nature, growing up in the wilderness land their father had chosen with all its freedoms and adventures. "Once Algie and I were going out to shoot one of the plentiful flying grey squirrels with our single shot .22," Frank said. "It was all heavy timber, right up to Heron. We decided to walk up to the meadow and from there we went over to Denny Brooks. That was a long ways from home and we wanted him to take us down to the train. "He said you aren't going out until you eat supper. After they made us eat supper they took us down to the saloon at Cabinet to await the eastbound train. "At the saloon there was an old fellow by the name of Churchill. He'd broke his leg about a week before and gangrene had set in. The nearest man of medicine, Doc Page, was supposed to come up on the train from Hope. Algie and I sat there in the section house waiting but in the hubbub we missed the train so we had to wait until a lone engine came by and we could flag it. "While we sat there they grabbed old Churchill and brought him in and laid him on a kind of a bed they fixed up. The doctor pulled Churchill's pants leg up and looked at his leg and says, 'We got to cut it off. He can go to the hospital in Sandpoint but he won't live 'til he gets there if we don't cut that leg off'. "They got a bottle of whiskey and started pouring it down Churchill. Old Doc started sawing the leg off while we sat there all bug-eyed, watching. He cut the meat off and pulled it up and sawed the bone off and stretched the meat over it, sewed it up, slapped a bandage over it and away he went with Churchill on the next train to Sandpoint. "Burk flagged us down a lone engine and got us on to Heron."64. The spring weather was bad in 1899 but in June the geological survey team worked east from Rathdrum to Missoula under H. S. Crowe. Then the team went on to The Dalles, Oregon, mapping this vast land still considered a wilderness by the rest of the nation as well as by the inhabitants living in it.65. In 1899 Massey was the constable at Thompson Falls. The railroad was most often his means of travel throughout the county. Depot stops, the saloons along the way, anyone who would talk and confide, were essential to his profession. In 1899 he secured a stolen fur overcoat from a transcient and took the train to return it to Joseph Poirier at Rathdrum, Idaho.66. That same year the railroad discontinued passenger trains No.3 and No.4 due to lack of business.66. At Noxon Massey called on the Knutsons, stopping to admire their newborn baby son, John, who joined his older brother on June 6, 1899. He lifted laughing two year old Charles atop his shoulders and in the railroad section house parlor he admired the baby in the mosquito netting swathed cradle and congratulated Mary and Andrew on adding to the scanty population.67. Georgia Knott McSpadden, tape-recorded oral history. Missoula Gazette, March 20, 1889. Clifford R. Weare, Frank Berray, Swan Swanson, Helen Berray Kirschbaum, tape-recorded oral history. History of The Northern Pacific Railroad, by Louis Tuck Lenz. Georgia Knott McSpadden, tape-recorded oral history; National Archives. Missoulian, May 22, 1889; Missoula Gazette, May 29, 1889. Frank Berray and Helen Berray Kirschbaum, tape-recorded oral histories. Frank Berray recorded oral history as told to Faye Cooey, U.S. Forest Service. Caspar Berray, undated newspaper clipping; Frank Berray, tape-recorded oral history; Helen Berray Kirschbaum, tape-recorded oral history and letters. Caspar Berry undated newspaper clipping. Harry Tallmadge, Frank Berray, and C. R. Weare, tape- recorded oral histories. Harry Tallmadge, tape recorded oral history. Missoula Gazette, March 25 and 26, 1889. Missoula Gazette, June 21 and 26, 1889. Their offices were at Rutherford and Tower's in Missoula. Missoula Gazette, July 9, 12, 17 and Sept 5, 1889. Missoula Gazette, July 22, 25, and 28, 1889. Missoula Gazette, July 28, 1889. Polk Gazeteer, 1889, and Missoula county courthouse records. Anaconda Standard, July 7, 1891. Missoula county courthouse - commissioner journals. Polk Gazeteer and University of Montana Archives (incomplete) list of businesses. Polk Gazeteer, 1886 and 1892. Polk Gazeteer, 1892. By 1892 Heron's population was down to seventy-five. Newkercher, Abey and Company built a shingle mill. Stewart Hampton, oral history, 1978. Spokesman Review, undated newspaper clipping. Letter, Northern Pacific Railroad, March 7, 1962. N. M. Lorentzsen, Spokane District Superintendent, NPRR. Johnny Knutson, tape-recorded oral history, 1972. Histories compiled by Dorothy H. Hunton, Thompson Falls, MT, 1966. Manuscripts by: Evelyn M. Davis, Ruth Harlow, Russell R. Ross and others. Missoula county commissioner journals. The capitalization of House in the commissioner journals suggests he was running an eating place or stopping place. Charles Knutson, tape-recorded oral history, November 1983; Frontier Index, January 1896. Frank Berray, tape-recorded oral history November 15, 1971. Frank declared this had been one of the best things that ever happened to him. It taught him honesty. Frank Berray, tape-recorded oral history November 15, 1971. Johnny Knutson, tape-recorded oral history, 1972. Johnny became one of the very few children born at Noxon who claimed the town as home all his life. He married Eleanor. At Noxon, they raised a son, Charles John, and a daughter, Ruth Marie. Johnny, Eleanor and their son, Charles are buried in Noxon cemetery.